Exotic tropical fruits are a new and growing industry in Hawaii. There are 390 acres devoted to exotic tropical fruit production in the state, 64% of that is located on the Big Island. Lychee and rambutan - small, bright red with a sweet grape-like flavor, a favorite sight in summer. Durian - a large green, spiked fruit, claimed by some to be an aphrodisiac, and others complain it smells like stinky feet! Mango - a well-known and desired tropical fruit. These tropical fruits are sold fresh to hotels, restaurants, and food stores during harvest season. To extend their uses, some are also processed into juices and some are dried. 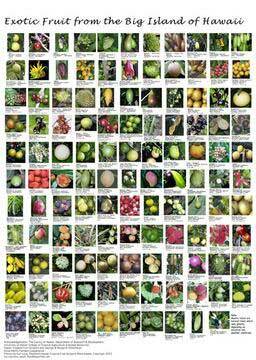 Wondering where to find exotic fruit? Visit an organic farmer, enjoy a a treasure hunt trip to the many farmer's markets on the Big Island, or order up the daily special and enjoy a colorful end to an eventful gourmet meal at the finer restaruants.